ACTON -- It took a group of fifth- and sixth-graders to push a radical idea: Why can't the most intense rivalry in Major League Baseball be put on hold, at least long enough for a handshake? Their plan -- to get the Yankees and Red Sox to shake hands just before Fenway's Opening Day game on April 11 -- has been endorsed by the Boss himself, Yankees owner George Steinbrenner. Baseball Commissioner Bud Selig said he ''found it fascinating." And Red Sox manager Terry Francona said he liked the pupils' initiative. But whether the schoolchildren from the Merriam School in Acton get their wish, which they have pushed with letters and a sophisticated PowerPoint presentation, remains squarely in the hands of the players. Francona said he liked the idea, but is not going to push it. ''If our guys want to go shake some hands, they're going to do it," he said yesterday. ''I'm not going to make them." The plan technically runs counter to a big-league rule, which has been occasionally flouted, as it was in last year's National League playoffs. In professional hockey, handshakes between opposing teams are a routine part of series-ending play in the postseason. ''The Merriam School Handshake Project" was launched last fall, after the Red Sox rallied from three games behind to beat the Yankees in the American League Championship Series. 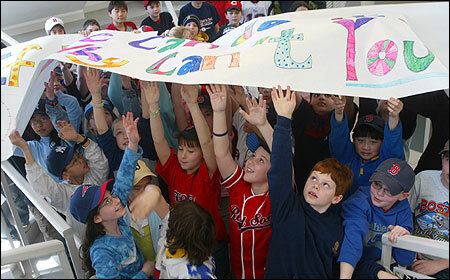 Tensions between the school's opposing Sox and Yankees fans boiled over in the schoolyard and in the classroom. ''Kids were intimidated; they were afraid to wear their Yankees hats," said Ed Kaufman, a fifth-grade teacher and Yankees fan who helped to organize the campaign. ''Things were just crossing the line from respectful and fun." So after school assemblies addressing sportsmanship, students put together the PowerPoint show and mailed and e-mailed it with letters urging team owners, managers, and captains to support the Opening Day shake. ''Fans and players are getting too worked up about what's just a game," the students wrote in their letter to Selig. ''The negativity and intensity is influencing children's sportsmanship after our own sports games. After children's sports games, we shake hands with the team we're playing. . . . If kids can show good sportsmanship, then professionals can too." After reading the letter, Francona called the school and talked with Mary Ann Brandt, a sixth-grade teacher who helped launch the project. When Francona said he could not authorize the handshake without player support, Brandt pleaded with him. ''I said: 'Terry, we're educators. We don't make anybody do anything. We educate. We persuade. We encourage,' " Brandt said. ''Then I told them we sent the same thing to the Yankees, and he said, 'Oh they'll never do it.' . . . Finally he said, 'Well, let me talk to Jason [Varitek].' "
''She got a little adamant," Francona said. The Steinbrenner camp offered a different reaction. ''The Yankees would be pleased to help," Steinbrenner said through his spokesman, Howard Rubenstein. ''He thinks it's a great idea," Rubenstein said. The Boss may have to lobby his bench, though. ''I commend these students for their remarkable initiative," Jason Zillo, a Yankees spokesman, quoted shortstop Derek Jeter as saying yesterday. ''While shaking hands before a game may not be practical, sportsmanship and respect are at the heart of this game that we love." When asked what was not practical, Zillo responded: ''You don't have to shake hands to play the game the right way." Kaufman said the students' campaign sought to deal with the hard time some children have in distinguishing between healthy rivalry and antisocial behavior, such as bench-clearing brawls between the Sox and the Yankees in recent years. Two examples: Pedro Martinez dropping former Yankees coach Don Zimmer in 2003 and Varitek shoving his mitt into the face of Yankees third baseman Alex Rodriguez last year. The handshake idea started slowly, but grew as more students talked about it, said Maddie Freeman, a sixth-grader. ''You don't want to end up hitting each other just because someone is on the other team, like they do," she said. The PowerPoint show begins with an image of students saying, ''We look up to you." A series of photos follows, with one showing Varitek going at it with Rodriguez and another portraying children shaking their fists at one another. One is dressed as Zimmer. Beneath that image, a caption reads, ''We follow your example." Next is a professional example: a photo of a Los Angeles Dodger shaking hands with a St. Louis Cardinal after the National League Division Series. The caption reads, ''Why can't you?" There is a rule against the handshake, though it has rarely been enforced. Rule 3.09 of the official playing rules says: ''Players of opposing teams shall not fraternize at any time while in uniform." That did not stop Cardinals player Larry Walker from organizing the team handshake with the Dodgers last fall, said Jim Anderson, the Cardinals' assistant director of media relations. ''In hockey they beat their brains in for seven games and then shake hands," Anderson said. ''Larry wanted to know why baseball players couldn't do something like that?" Chris Snow of the Globe staff contributed to this report. Douglas Belkin can be reached at dbelkin@globe.com.